Great Article, thanks for the break down! I have once question. 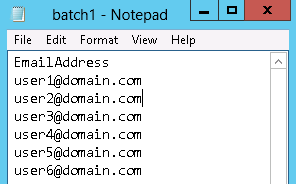 If the EUC can do a single mailbox, since that is the only command it uses in the web gui. What is the powershell command behind that, I am trying to do a move without a csv. Thanks! I’m glad you liked it. You can actually also move a single mailbox using the same cmdlets here. The benefit is that you’ll have the same ways of following up with the batch (even though it would contain only a single user).